New car registrations increased by 17.5% last year when compared with 2015, while Toyota was the most popular manufacturer during 2016. According to figures from the Society of the Irish Motor Industry, 146,672 new cars were sold across the year, the highest number since 2008. 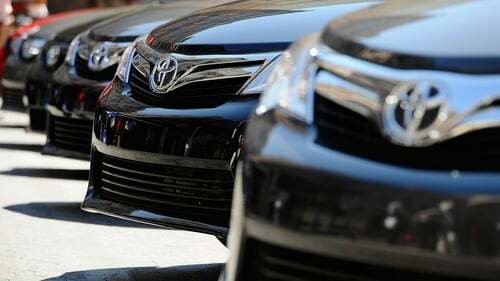 Toyota was the top-selling manufacturer of 2016, ahead of Hyundai, Volkswagen, and Ford. The Hyundai Tucson was the best-selling car model last year, with its sales eclipsing those of the VW Golf, Ford Focus, and Skoda Octavia. In a sign of a strengthening economy, commercial vehicle sales were also significantly up in 2016. Light Commercial Vehicles saw an increase of 18.3%, while HGV sales jumped by nearly a third. Director General of SIMI Alan Nolan said: “Despite some slowing in the second half of the year, the numbers are in line with expectations at the start of 2016 and underline the continued growth and buoyancy in the economy. “Used car imports have also seen growth, partly due to the strong economic recovery, but also driven by short supply of 2009-2013 Irish used cars and the strengthening of the Euro against sterling following the Brexit Referendum. “Almost 50% of imported used cars were in this age profile, between three and five years old, and almost another 40% are over six years old,” he added. SIMI said it expects a continuation of the strong performance seen in sales during 2016 to continue this year.